“All our dreams can come true if we have the courage to pursue them”; the famous quote from Walt Disney, the pioneer of the American animation industry, is the customary mantra of any entrepreneur in the world. For every one of them, the courage to follow their heart-desired dreams is mandatory, as there will be a great number of obstacles in your path before you reach your dream. Entrepreneurs with great courage and passion have changed the world, touched the lives of people – and they will continue to do so; there is no stopping in that. 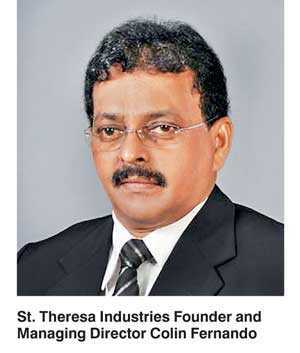 The story of Colin Fernando and the birth of St. Theresa Industries Holdings (STI Holdings) in Sri Lanka are of the same nature. His story is full of inspiration, courage, commitment and a lot of ‘Yes I Can Dos’. The company he built 45 years ago has today become Sri Lanka’s number one manufacturing company for all types of steel fabrication and accessories used for power generation, transmission and distribution. STI Holdings operates in the transmission and distribution of electrical power, solar power, hybrid solar, construction, electrification, steel fabrication, and telecommunication industries. Ventured in 1973 with a very humble beginning, STI Holdings has embraced innovation to build a true Sri Lankan powerhouse in the spheres of power generation and manufacturing industrial steel products for power transmission with state-of-the-art facilities. While expanding its leadership position in Sri Lanka by pursuing global best practices, STI has transformed itself into a multinational company that nurtures thousands of corporates and households across four continents. During the past two years, the company has been in full steam ahead to elevate its net worth to Rs. 1.5 billion, which it has successfully done. Today, STI Holdings consists of five subsidiary companies, which are St. Theresa Industries, St. Theresa Industries Kenya, Samudra Lanka, STI projects and SINO – STI Corporation. Each company contributes to the GDP of Sri Lanka in a massive way through various social and economic contributions. A member from a very humble family in Mutwal in Colombo, Colin Fernando was inspired to become a leading businessperson in Sri Lanka since he was 10 years old. With his father being the only source of income generation and his mother having to look after six children, Colin decided to do a job after his O/L exam. He found a job at a small fish export shop owned by one of his friends inside the St. Johns Fish Market. Later, when the shop was about to be bankrupt, he offered his friend a portion out of an investment he made to kick start the business and they operated a successful B2B (Business to Business) operation where they purchased fish and sold them to fishery exporting companies. The business still exists today under the name ‘Samudra Lanka Enterprises’, a supplier of fisheries and other food items to top Sri Lankan hotels and supermarket chains. However, the game-changing moment came in 1973 when his father bought a lathe machine to start a small-scale welding shop. As a former employee of the Colombo Harbour, Colin’s father possessed the required expertise and Colin, being a young and energetic entrepreneur, had the vision to develop this into a much bigger venture. He applied for a loan of Rs. 1,200 from Bank of Ceylon (BoC) and registered his business in the same year as St. Theresa Industries. “When registering the company, I couldn’t think of putting a better name other than my mother’s name ‘Theresa’. I wanted to honour her name; she took care of me and my siblings, fought hard to give all of us a proper education by overcoming a number of hardships,” Colin reminisced with Daily FT. In the beginning, Colin undertook orders mainly from hotels to reproduce and repair trolleys and kitchen equipment. With more people getting to know about his quality service, the demand for work got higher. This paved a way for St. Theresa Industries to expand further and Colin bought the second lathe machine in 1979 with an SME loan from BoC. With more working coming towards his way, Colin bought a land in Mutwal close to his home in 1982 and moved everything to the new venue. Consequent to the gradual expansion of the industry, Colin shifted the industrial site and office from Mutwal to their own premises at Sapugaskanda in 1987. During the mid-1980s, Colin took a brave decision to cater to the requirements of the Ceylon Electricity Board (CEB) and his decision was encouraged by his trusting advisors at Bank of Ceylon. He clearly remembers how he bid for his very first order in 1985 – in order to galvanise CEB transmission towers. “I entered the bidding process without any prior knowledge about galvanising but my ‘yes I can do’ attitude pushed me to do that. I got the order during the second bidding process and it was worth Rs. 9 million. Day and night, I roamed Colombo to find skilled people to complete this job. Luckily, I was able to find 13 people who were master galvanisers. We finished the project well before the deadline and it was a major achievement for St. Theresa Industries,” said Fernando. Subsequent to shifting their production and operational units from Mutwal to Sapugaskanda in 1987, STI Holdings relocated their office premises into a more spacious and well-equipped four-storied building in 2012 in view of the gradual expansion of its operational team. In 2013, the company purchased a range of modern machinery and constructed a factory building at their existing factory site exclusively for the ‘Tower Manufacturing Unit’ with funding from Bank of Ceylon. This made St. Theresa the only local enterprise equipped with such sophisticated machinery in Sri Lanka for manufacturing transmission towers. The rest is, of course, history. After 45 years, St. Theresa Industries has built up a reputation for reliability, quality, timely delivery and competitive pricing amongst their buyers in the metal fabrication industry of Sri Lanka. The company has been serving some of the elite public and private organisations including CEB, Lanka Electricity Company Ltd. (LECO), Ministry of Defence and other leading private sector organisations. Being the only private transmission tower manufacturer in Sri Lanka, St. Theresa Industries has contributed for completion of 98% of power distribution in Sri Lanka through their product range. STI Projects, another subsidiary of the Holding Group, undertakes engineering procurement construction (EPC) projects for power transmission and communication Sri Lanka. Turn-key projects in the country have created a competitive advantage in the industry for the company and with its strong ties with global partners STI Projects has been successful in welcoming major foreign direct investments for a number of ventures in Sri Lanka. With a core business in trade-in products, Samudra Lanka is STI Holding’s importer and supplier of all types of copper, aluminium, bimetallic connectors, compression tools and other products. The company has forged many strategic partnerships over the last two decades with some of the top international names such as Burndy LLC, Chance, Hubbell and CTC Globe in the USA. They have suppliers from India, Canada and South Africa as well. Four years back, STI entered the East African market by establishing St. Theresa Industries Kenya Ltd. This was the first time that a Sri Lankan company entered the Kenyan market and over the years, the company has been successful in offering a fully-fledged portfolio of industrial steel products for numerous projects conducted by global organisations. “We identified that electrification in Kenya is just 27%. It was the perfect time for us to enter the market with our innovative solutions and diversify our business. We have 50 Kenyans working in our manufacturing plant and the ability to carry out hot-dip galvanising at our own facility provides a greater competitive advantage for us,” Fernando opined. The company has been able to serve a range of products to Kenya Lighting and Power Company, Rural Electrification Authority and Kenya Power Transmission Company. The Kenya Bureau of Standards and the Kenya Association of Manufacturers have certified STI’s manufacturing plant in Kenya. While serving in Kenya, the company is gradually expanding into Uganda and Ethiopia as well, strengthening their presence in the East African region. Speaking with us about the challenges the industry is facing, Fernando said that authorities should get rid of their conventional thinking hats to develop the local metal fabrication industry to be more competitive in the region. He mentioned that there is a dire need to set up a proper galvanising plant in Sri Lanka. Very soon, STI Holdings is going to introduce helical anchoring into Sri Lanka. A 100-year old technology, helical anchors are commonly selected for earth anchoring applications because they are quick to install and can be proof-tested and loaded immediately. With the introduction of this technology, a CEB transmission tower could be installed within six-seven days; it takes 21 days presently to set up the foundation of the tower. This will be a major uplifting for the industry and STI Holdings believes there will be more opportunities available for companies in the piling industry as well. The company has already started building a technologically advanced block called ‘Sino-STI Block’. It is created from recycled material such as coal ash and cement. It will be a direct replacement to the conventional cement block used in the industry, which will have many benefits financially and in engineering quality of the construction. It is constructed to be four times harder than an ordinary cement block.